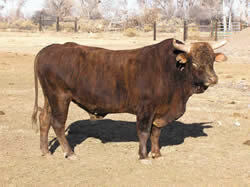 Son of Trick or Treat, a many times NFR bull of Oscar bloodline. Haunt's mother is a daughter of Gunslinger and Butler's great cow 107. Butler's Haunt really bucks, he was scored 23 twice as a 3 year old.